Motion sensor light switches, or occupancy sensors, wire in just like a regular light switch, and are most often seen in public restrooms, but work just as well in your home, wherever your kids forget to turn the lights off when they leave, or for switching an outlet with other devices plugged in. This model turns the power on when it detects motion or the switch is pushed, and off after a predetermined duration (30 seconds, 10 minutes, 20 minutes, and 30 minutes), or pushing the switch again. 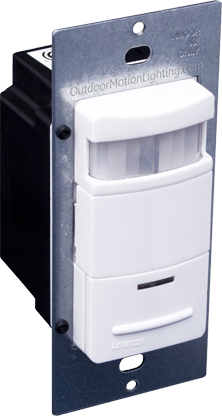 This ODS10-ID Leviton occupancy sensor in particular is made to work with a wide variety of loads, including florescent ballasts. You could also use it to run something like a bathroom ventilation fan. I would avoid the cheaper models, because this is one of those sensors that can be really irritating if it isn’t functioning right. You can wire several of these occupancy switches up to the same load (if you have an L shaped room or hall to light for instance) and the switch won’t go off if any of them have recently detected motion. 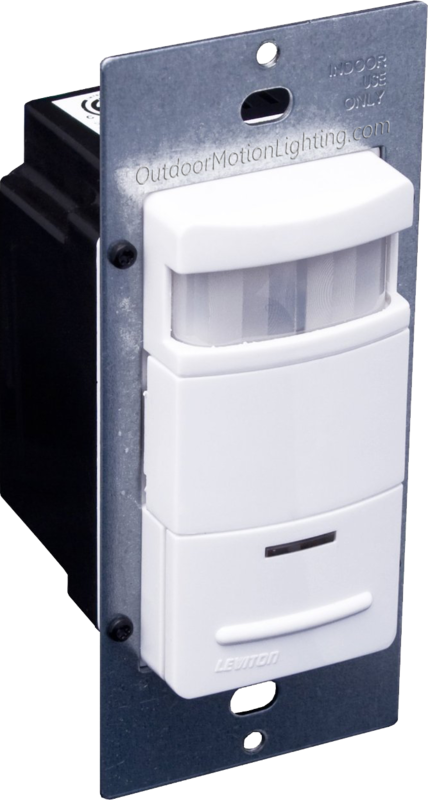 This is a single pole indoor motion sensor, and is not weatherproofed. It has a 180° sensing zone, up to 40′. It has adjustments for sensitivity, duration, and can be adjusted to only turn on if the ambient light is below a certain brightness, which is another great energy saving feature. There is a red LED in the sensor that blinks when it detects motion, so you can fine tune the controls quickly. This fixture comes in different colors and fits standard Decora wall plates, so make sure you have one on hand.